The world was created using the twenty two letters of the Hebrew alphabet. The Bible tells us that of G-d created the universe with a few words, “Let there be light”. Kabbalists added to the Bible concluding that G-d existed before the creation of the universe and that the Creator created the universe using Sefirot (the ten sacred numbers) and a second set of Sefirot (the twenty-two letters of the Hebrew alphabet). Kabbalists believe that different combinations of the letters formed the world and everything in it. Twenty-two sounds and letters are the Foundation of all things. Three mothers, seven doubles and twelve simples. 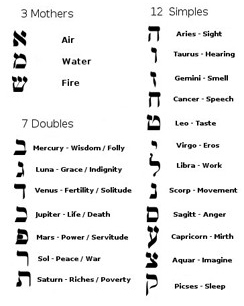 The Three Mothers are Aleph, Mem and Shin; Air, Water and Fire. Water is silent, Fire is sibilant (producing a hissing sound) and Air derived from the Spirit as the tongue of a balance standing between the two; reconciling and mediating between them. The Three Mothers are a great Mystery sealed with six rings. From them came Air, Fire and Water which divide into active and passive forces. The Three Mothers are the Foundation. From them spring the three Fathers and from these the world. The heavens were produced from Fire, the earth from Water and Air from the Spirit. The Seven double letters, Bet, Gimel, Daled, Kaf, Peh, Resh, and Tav have two sounds associated with each of them. They are Life, Peace, Wisdom, Riches, Grace, Fertility and Power. The two sounds of each letter are the hard and the soft (the aspirated and the softened). They are called double because each letter presents a contrast; Life and Death, Peace and War, Wisdom and Folly, Riches and Poverty, Grace and Indignation, Fertility and Solitude, Power and Servitude. The Seven Double Letters produced the planets, the days of the week, and the Gates of the Soul (our orifices of perception). From these seven came the Seven Heavens, the Seven Earths, and the Seven Sabbaths. G-d loved the number seven more than all things under Heaven. 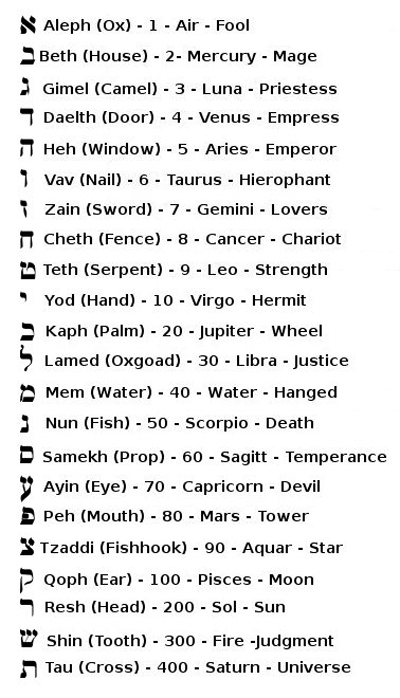 The Twelve Simple Letters are Heh, Vav, Zion, Chet, Tet, Yod, Lamed, Nun, Samech, Ayin, Tzaddi and Qoph. They are sight, hearing, smell, speech, taste, sexual love, work, movement, anger, happiness, imagination and sleep. The Twelve Simple Letters formed the twelve celestial zodiac constellations, the months of the year and the twelve organs; two hands, two feet, two kidneys, the spleen, the liver, the gall bladder, sexual organs, the stomach and intestines.